A helpful representation of the approximate boundary of the ‘kingdom’ of Rhwng Gwy a Hafren, the land Between the rivers Wye & Severn, can best be seen on this map (left) which was published in Sir John Edward Lloyd’s magnificent A History of Wales from the Earliest Times to the Edwardian Conquest, 1911. One caveat: the map should not be taken as being a perfect and precisely correct presentation of the boundaries of each regional or local land unit as they existed and were accepted by Welsh rulers in the Middle Ages, since it is likely to have been based on 16th century Tudor-era cartography. 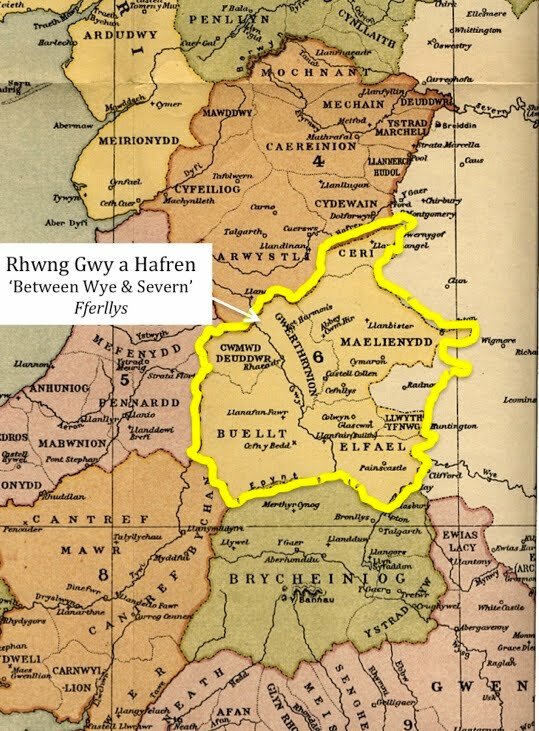 The area he showed as representing Rhwng Gwy a Hafren is indicated as region ‘6’ coloured in yellow - an extended boundary has been added, indicated by a yellow border. One can read the names of the divisions (Cantrefs and Commotes): Maelienydd, Elfael, Buellt, Gwerthrynion, Ceri Radnor and Cwmwd Deuddwr. Of these the first two were the most significant, but it was in Ceri that the descendants of Elystan last held lordship over any of his patrimony. Llwythyfnwg is a strange name that is shown as a commote south of Radnor; however, sometimes the name is given for the same area encompassing Radnor also. Radnor Lordship is not included on Lloyd’s map as part of Rhwng Gwy a Hafren, but we know from Gerald of Wales’ tour of Wales in 1188, with the Archbishop of Canterbury, that Elystan’s dynasty controlled the Radnor area at that time and had done historically long before, since it (and ‘Llwythyfnwg’) were purely divisions of the larger and original Elfael. Gerald recorded that they met Prince Einion o’r Porth, Prince of Elfael at Radnor Castle in March of that year and his effigy can be seen on his grave slab, which lies inside New Radnor Church. Einion’s cousin, Prince Maelgwn ap Cadwallon of Maelienydd greeted Gerald and the Archbishop of Canterbury at Castell Crug Eryr a few days after they had been at Radnor. Some say that parts of Cydewain and Arwystli were also held by members of Elystan’s extended family; perhaps only up to the River Severn. To the north is Arwystli and Powys Wenwynwyn and beyond (in green) Powys Fadog. The names of these two Powys kingdoms resulted from the division of a united Powys after the death of Madog ap Maredudd in 1160. 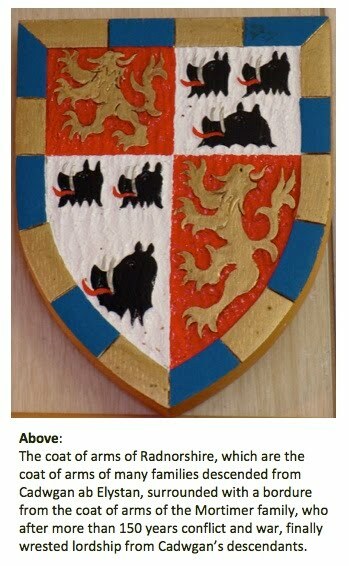 The northern portion was inherited by his son Gruffudd Maelor, from whose son Madog it gained its name ‘Powys Fadog’. The southern portion was inherited by Madog ap Maredudd’s nephew Owain Cyfeiliog ap Gruffudd, who was succeeded by his son Gwenwynwyn, whose name resulted in his kingdom being known as ‘Powys Wenwynwyn’. Beyond Arwystli and Cyfeiliog the map shows Meirionydd and Ardudwy, parts of the old northern kingdom of Gwynedd, ruled by famous Princes such as Llywelyn ap Iorwerth (known as Llywelyn the Great) and his grandson Llywelyn ap Gruffudd (Llywelyn the Last). To the south and south east lay Brycheiniog and south east of that, the old region of Gwent. 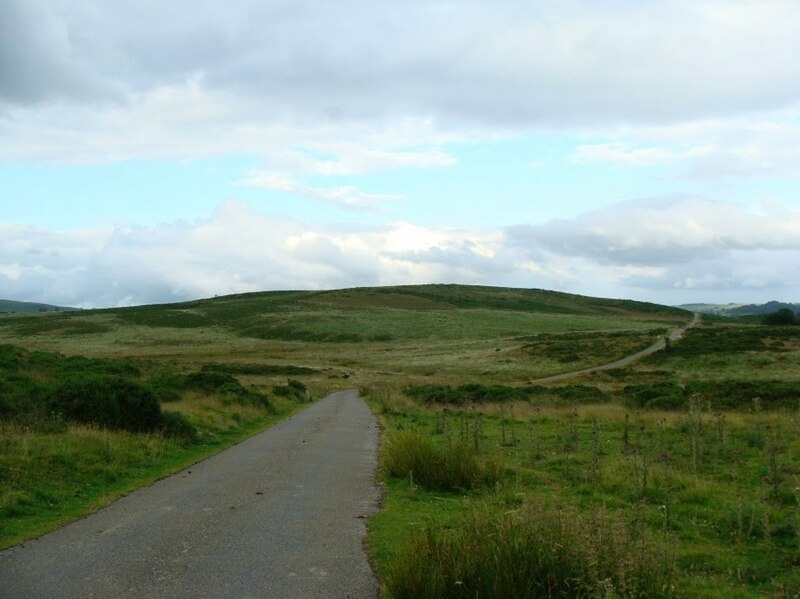 To the south west lay parts of the old southern kingdom of Wales - the Dehuebarth, which was once ruled by that great Welsh leader Rhys ap Gruffudd better known to history as The Lord Rhys. The map shows some of its sub-divisions: Ystrad Tywi (marked ‘8’) including Cantref Bychan and Cantref Mawr, and Ceredigion (marked ‘5’). 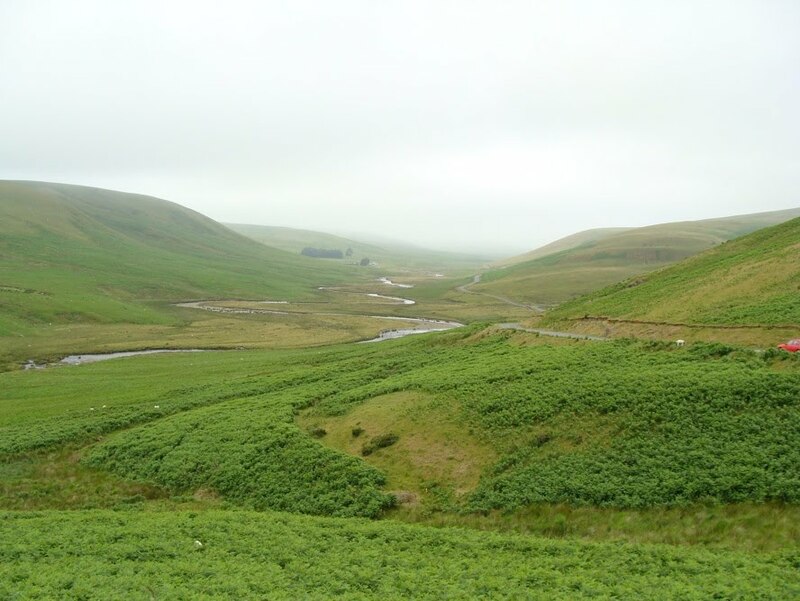 In May 1998, historian Paul Remfry wrote a fascinating article called ‘Discovering the lost kingdom of Radnor’ in Issue No.34 of British Archaeology magazine. In it he writes about the historically neglected region of ‘Between Wye & Severn’ and, picking up on earlier research by historian Bruce Coplestone-Crow in the 1980s, puts forward the argument that Cynllibiwg (his modern spelling for Cinlipiuc) must be considered as one of the four principal and competing kingdoms of 12th century Wales, alongside Gwynedd, Deheubarth, Powys. The name ‘Cynllibiwg’ refers to Saint Cynllo, who is closely connected to this region. The ancient church in Llanbister, dedicated to St. Cynllo, is the Mother Church of Maelienydd. looking north west on the approach towards Cymaron. 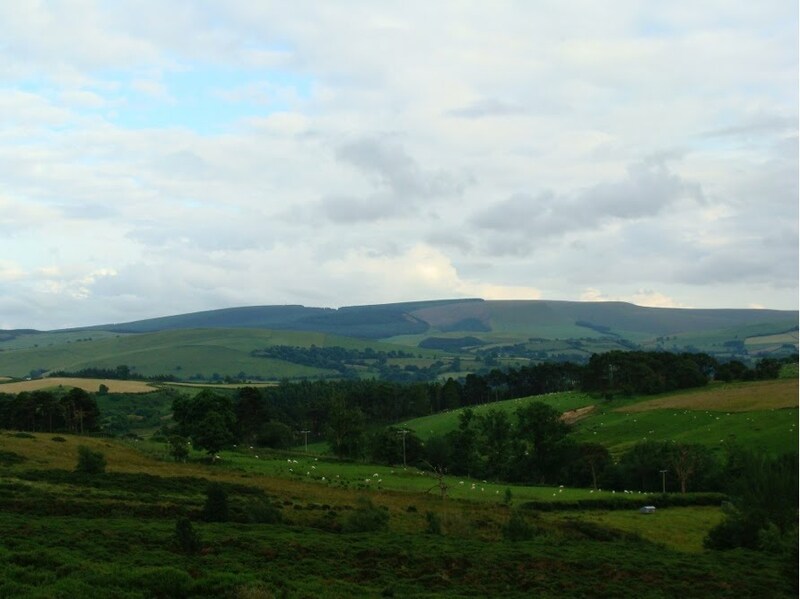 Below: A view south across Moelienydd to the upland of Radnor Forest, whose old Welsh name is Fforest Clud. Elan Valley, from just above Pont ar Elan. Aber Glanhirin farm is visible to the right of the trees in the centre.